Now that the economy has picked up some, the housing market is recovering a little, and memories of the financial crisis are fading, some lenders are re-introducing a few “creative” financing methods. It's possible to get an interest-only mortgage again, or get a loan with a low, low rate at the beginning. 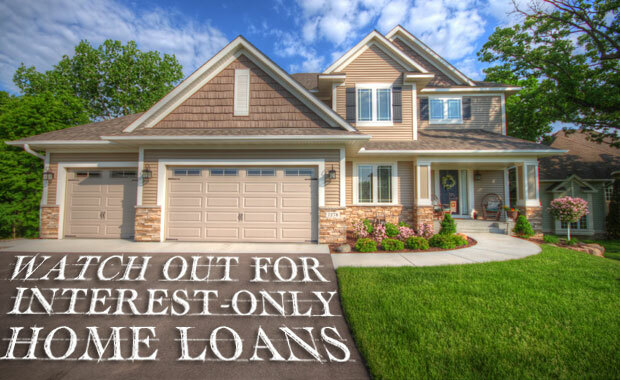 An interest-only loan is tempting because the borrower only pays the interest each month. This state of affairs can last from five to 10 years. When you only pay the interest, it feels like you can “afford” more house. You aren't paying the principal, so you are only paying one part of the loan, and it seems like a good idea. However, you could actually end up in big trouble. While some lenders are re-thinking interest-only home equity lines of credit, others are comfortable offering these types of options to those looking to buy a home. Before you go for an interest-only loan, though, it's important to understand what you are getting into — and to reconsider. One of the biggest problems with an interest-only loan is how it hampers your ability to build equity in your home. An amortization calculator can help you see how fast your mortgage balance is decreasing. With an interest only loan, you're not paying down the principal, so you really aren't making much headway. If you have to sell your house, you might find that there isn't enough equity in your home to leave anything left over for you after the sale goes through. It also makes it practically impossible to refinance your home, since you don't have the equity needed to put lenders at ease. A home bought with an interest-only mortgage seems affordable at first, but it quickly becomes apparent that it's not affordable in the long run. The biggest problem with getting an interest-only mortgage is that you end up paying a lot more later. Once you start paying on the principal (something that happens after the initial period is over), payments can skyrocket. It's vital that you understand this reality of interest-only home loans. Many homebuyers who took the plunge with interest-only mortgages prior to the housing crash and financial crisis did so expecting to make more money in a few years. They thought of a higher income, able to handle the payments. Other homebuyers assumed they would be able to refinance. Even though they weren't paying down principal, the assumption was that housing costs would keep climbing, so equity would be built, even without mortgage principal payments. They could refinance before the higher payments hit, and things would work out. Unfortunately, the fact that these types of loans are starting to become available again means that there could be more problems down the road. And, of course, analysts are on the watch for what is going to happen in the next little while, since there are still interest-only loans from the past that still haven't worked their way through the system. When many Americans think about retirement, they are pessimistic — and for good reason. According to a recent COUNTRY Financial Security Index survey, 25 percent of Americans say that they are not saving for retirement at all. If you aren't saving toward your retirement, it's hard to be optimistic about it. Additionally, there is a great deal of pessimism among people in my own age group (age 30 to 39) about the ability to have a comfortable retirement. In fact, 47 percent of adults in my age group think that it's impossible for a middle-income family to save for a secure retirement. When you look to those 40 and older, 47 percent of them regret that they didn't start saving for retirement earlier, reports COUNTRY. However, you don't have to feel pessimistic about retirement, especially if you are in my age group or younger. Take action now, and you can start to feel better about your chances for a comfortable retirement. 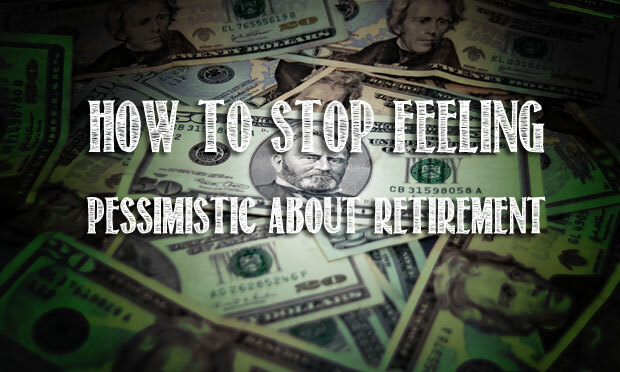 Much of the time, people are pessimistic because they don't actually know what they will need in retirement. Take the time to sit down and estimate what you will need. That will give you a starting point. Then, break it down. If you look at the final number, chances are that you will be discouraged by the amount you will have to save. Instead, look at things in terms of monthly income, and in terms of what you can set aside each month for the future. Open an account at a brokerage like Betterment, and you can also get a projection of what your current savings plan will yield you by your retirement age. I began feeling better about my own retirement when I looked at the projection. Compound interest is more powerful than you think, and running a calculation that can help you prepare for your needs can be a great way to move forward. Another way to feel better about your situation is to take action. You can start investing for retirement right now. Betterment is a great place to start. If you can put in $100 a month, you can get started with an IRA that will help you invest better for the future. One of the great things about Betterment is that it keeps you on track, and helps you stay in automatically. But you don't have to start there if you don't want to. You can also start by contributing to your employer's 401(k) plan. Have the money taken out of your paycheck. At the very least, open an account at a discount brokerage with $25 and make regular contributions to purchase shares of an index fund. Anything is better than nothing when you plan for the long-term. Over time, as your financial circumstance change, add more to your regular retirement account contributions. But getting started now will help you overcome some of your fears about retirement. One of the worst things you can do is nothing. Take action and start investing for retirement today. You'll feel better, and you'll be motivated to make a plan to better secure your financial future.